New RBI data on India’s Balance of Payments (BoP) for 2017-18 show current account deficit (CAD) at $48.72 bn, the highest since the record $88.16 bn of 2012-13. With CAD expected to widen to $75 bn during this fiscal, how vulnerable is the overall BoP position today? Let’s start with foreign exchange reserves. Are they sufficient now? 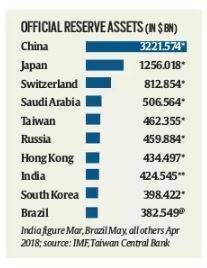 India’s forex reserves, at $424.55 billion as on March 2018, are actually the eighth largest in the world (smaller chart right). Also, they can finance 10.9 months of imports, compared to 7.8 months in March 2014 (just before the Narendra Modi government came to power), 7 months in March 2013 (when there was a mini-BoP crisis, with the current account deficit hitting a peak), and 2.5 months in March 1991 (which forced the country to seek International Monetary Fund assistance). Any allusion to a “crisis” from that standpoint is highly misplaced; the RBI’s current forex war chest is clearly sufficient, both to meet immediate import needs and to stave off a run on the rupee of the kind that was seen during May-August 2013. So, when economists speak of India’s BoP vulnerabilities, what exactly are they trying to say? Countries generally accumulate reserves by exporting more than what they import. 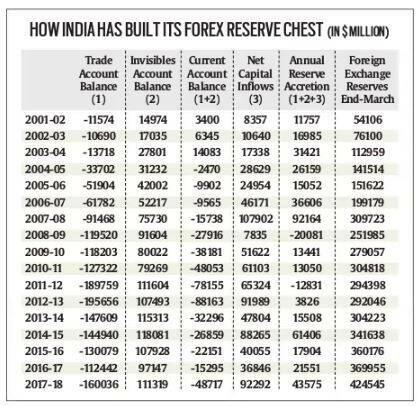 IMF data on the current account balances of the top 10 forex reserves holders reveal all of them — barring India and Brazil — to have been running surpluses year after year. India has always had deficits on its merchandise trade account, with the value of its imports of goods far in excess of that of exports. At the same time, the country has traditionally enjoyed a surplus on its ‘invisibles’ account. Invisibles basically cover receipts from export of software services, inward remittances by migrant workers, and tourism and — on the other side — payments towards interest, dividend and royalty on foreign loans, investments and technology/brands, besides on banking, insurance and shipping services. But with the invisibles surpluses not exceeding trade deficits — except during the three years from 2001-02 to 2003-04 (bigger chart) — it has resulted in the country consistently registering CADs. How then has India been managing all these years with CADs, and even accumulating reserves? A country gets foreign exchange not only from exporting goods and services, but also from capital flows, whether by way of foreign investment, commercial borrowings or external assistance. The bigger chart shows that for most years, net capital flows into India have been more than CADs. The surplus capital flows have, then, gone into building reserves. The most extreme instance was in 2007-08, when net foreign capital inflows, at $107.90 billion, vastly exceeded the CAD of $15.74 billion, leading to reserve accretion of $92.16 billion during a single year. However, there have also been years, such as 2008-09 and 2011-12, which saw reserves depletion due to net capital inflows not being adequate to fund even the CAD. Is this model sustainable? How long can India continue to import more than it exports, and expect foreign capital to fully bridge the gap? India and Brazil represent unique cases of economies that have built reserves largely on the strength of their capital rather than current account of the BoP. India is even more unique because its currency, unlike the Brazilian real, is relatively stable, and not under frequent speculative attacks. In theory, a country can keep attracting capital flows to fund CADs so long as its growth prospects are seen to be good, and the investment environment is equally welcoming. It would help, though, if such foreign investment also goes towards augmenting the economy’s manufacturing and services export capacities, as opposed to simply producing or even importing for the domestic market. In the long run, that can help narrow the CAD to more sustainable levels. What is the outlook vis-à-vis the CAD and capital flows in this fiscal? The CAD fell sharply from $88.16 billion in 2012-13 to $15.30 billion in 2016-17, mainly because of India’s oil import bill nearly halving from $164.04 billion to $86.87 billion. However, in 2017-18, the CAD rose to $48.72 billion, courtesy resurgent global crude prices, and is expected to cross $75 billion this fiscal. There are signs of capital flows slowing down as well. Foreign portfolio investors have, since April 1, made $7.9 billion worth of net sales in Indian equity and debt markets. This is part of a larger sell-off pattern across emerging market economies, in response to rising interest rates in the US, and the European Central Bank’s plans to end its monetary stimulus programme by the end of 2018. The Swiss investment bank Credit Suisse has forecast net capital flows to India for 2018-19 at $55 billion, which will be lower than the projected CAD of $75 billion. In the event, forex reserves may decline for the first time since 2011-12. The RBI’s data already show the total official reserves as on June 8 at $413.11 billion, a dip of $ 11.43 billion over the level of end-March 2018. 3 In US college admissions: What’s ‘likeability’?